The Autoimmune Epidemic - Can Detox Treatments Help? You are here: Home / Natural Health / The Autoimmune Epidemic – Can Detox Treatments Help? 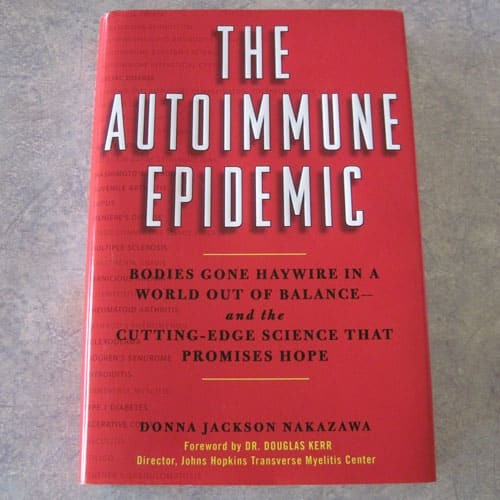 I recently read the book “The Autoimmune Epidemic: Bodies Gone Haywire in a World Out of Balance – and the Cutting-Edge Science That Promises Hope” and it was pretty darn scary. The numbers are staggering. At the time the book was published (2008), the National Institute of Health estimated that upwards of 23.5 million people in the United States suffered from some sort of autoimmune disease – 23.5 million. These include rheumatoid arthritis, lupus, multiple sclerosis, myasthenia gravis, mytosis, Guillain-Barre syndrome, Crohn's diesase, ulcerative colitis, inflammatory bowel disease, Hashimoto's thyroiditis and many others. Cardiologists were starting to look at how inflammation contributes to atherosclerosis and heart attacks. We are a nation under attack, but the “attackers” are our own bodies. Basically, an autoimmune condition is one where the body turns on itself and destroys its own tissues. Symptoms can be subtle, like fatigue or irregular bowel movements, or completely incapacitating like extreme joint pain and paralysis, with a myriad of symptoms in between. Oftentimes those with autoimmune issues are misdiagnosed, or told it's “all in their head”, or they're “just getting older”. Women, who make up roughly 75% of cases, are told that it's not unexpected that they should have certain symptoms as they age – for instance, the “4 Fs” associated with gall bladder inflammation “Fat, Female, Forty, and Fair” or “Fat, Female, Fertile and Flatulent”. I refuse to accept that are bodies should be “expected to fail” at a given age or set of conditions. This just doesn't sit right with me. After being diagnosed with Hashimoto's Thyroiditis, which is a condition where your immune system attacks your thyroid and results in hypothyroidism (an underactive thyroid), I started researching to find out why my body was going turning on itself. First, I don't even know what all of these are, although I could certainly look them up, but I know that they're probably not likely to occur in nature. Second, I don't think they're probably good for anyone, even if your body is designed to cope with a certain level of toxins. Since WWII, the synthetic chemical industry has expanded exponentially, bombarding us with herbicides, pesticides, cleaning agents, detergents, flame retardants, stain resistant and scratch resistant coatings, non-stick coatings, paint removers – the list goes on and on. While individual chemicals undergo some degree of testing, very little study has been done on how they interact, and what effect they have in your body as they accumulate over time. The EPA does make some attempt to track potential toxin sources (you can use this map to locate potential environmental impact sources in your area), but once materials leave a source, you are on your own. I just started reading the book Cure Tooth Decay: Heal and Prevent Cavities with Nutrition by Ramiel Nagel, and I'm wishing for two things – a) that I had read it about 30 years ago, and b) that I had more time to read it now, because it's really interesting. I'm right at the beginning of the book, but I was struck with the similarities between the germ theory of disease and the acid theory of tooth decay. Both were fairly recently adapted by the establishment, and both were challenged by alternative theories that focused on general health and nutrition. Basically, if your body is healthy, it can heal itself when faced with illness causing pathogens or tooth eating acid, if your nutrition is lacking, you get sick and/or your teeth rot. This seems logical to me. Of course, dramatic intervention like drilling and filling is a lot more profitable and gives much quicker results – but at what cost? My teeth are loaded with amalgam fillings. I didn't eat that badly as a kid, but I did eat quite a bit of refined sugar. I had pretty darn good dental hygiene, following all my dentist's recommendations to the letter, and yet still my teeth rotted. Now I've got to deal with the consequences. I didn't immediately connect my fillings with my thyroid problems (my dentist and internal medicine doctor were certainly no help), but I guess it should have been obvious. Any substance produced by any of the structures in the oral cavity, teeth, gums, tonsils, will be drained by the lymphatic system and carried directly to the thyroid gland. The thyroid gland has iodine binding sites where the iodine needed for its function is obtained. For those with chronic mercury exposure the mercury occupies some of the iodine binding sites, blocking full utilization of iodine by the thyroid, in addition to the direct damage to the thyroid since mercury is highly cytotoxic (392,394,etc.). Studies have documented that mercury causes hypothyroidism (50,84,390,407), damage of thyroid RNA(458), autoimmune thyroiditis (369,382,91), and impairment of conversion of thyroid T4 hormone to the active T3 form(369,382,390,407,50d). These studies and clinical experience indicate that mercury and toxic metal exposures appear to be the most common cause of hypothyroidism and the majority treated by metals detoxification recover or significantly improve (503). Thousands of tests at medical labs and many studies have documented that dental amalgam is the largest source of mercury in most adults that have several amalgam fillings, with exposures much above government health guidelines (501). No wonder I am in deep kimchee. Research conducted as early as a decade ago reported that old fillings viewed under an electron microscope showed holes where the mercury had evaporated, releasing 40% of the mercury into the body over a ten year period. The U.S. environmental protection safety limits for mercury exposure are 10 micrograms per day, yet mercury released from fillings can contribute up to three times this amount, just from the simple acts of chewing, brushing the teeth, or drinking hot liquids. Studies show that the average person makes and swallows 1.5 liters of saliva a day. Yet, if they have as few as four amalgams present in their mouth, their saliva is so high in mercury they cannot legally spit into the toilet in the USA. But wait – my fillings may also be causing electrical currents to be generated in my mouth. The fancy name is “Oral galvanism”, my name for it is “you've got to me kidding me – why didn't the dentist tell me”. The good news is that if I can get them safely removed, that may very well help with my thyroid symptoms. The bad news is I haven't been able to find a dentist in the area with a clue. There is a history of autoimmune disorders in my family. Most notably, my mom battled terrible autoimmune flare ups before she passed away in 2010. Several years before she died, she developed a red, itchy rash on her face after they switched her high blood pressure medication. They tried switching her back, but my guess (in retrospect) is that they hit some sort of epigenetic switch that set off her immune system and there was no turning back. (I didn't know then much of what I know now.) She saw doctors from around our state and the neighboring state – I even sent her medical records to the mom of of our exchange student in China. Dozens of treatments were tried, but none worked for more than a short time. When she was around my age, mom had an inflamed lymph node removed from under her arm. She also suffered from occasional bouts of phlebitis which caused her a lot of pain. Fast forward to situation at hand. Out of all of her kids, I'm probably the one closest, in terms of build, to my mom. I'd been diagnosed with bursitis in my left hip that first appeared after the delivery of my second son (nearly 12 years ago). I saw conventional doctors and therapists for around six months with the hip in 2007, and then finally gave up because there was really no change. My thyroid started flaring up in 2008, and then I started noticing a weird, itchy rash around the outside of my ankles that would come and go. I had a similar rash on the inside of right calf during the late summer for the last couple of years. This summer, the rash showed up circling my knees. I tried all types of topical treatments from standard OTC to home made salve, which would help for a while, but nothing cleared it up completely. Then I came across a post at Kitchen Stewardship where she mentioned a detox deodorant called Herbalix (that story here). I contacted Herbalix, we talked, they sent me samples of the Roseline and Detox deodorant, a small Smart Salve, plus small samples for the boys of the Tropical Cove, No Added Fragrance and Detox deodorants. Since that time I have purchased additional product on my own. My opinions are my own, too. This is a product that I have tried that works well for me. Since I can't get my amalgam fillings removed, I figured I'd start with what I can remove SAFELY on my own. If you look up Levothyroxin from the company of a RX list, you will find it contains Talc(alum), and aluminum lakes depending on the strength. Your probably allergic to alums salts and your thyroid does not need anymore alums salts. The physical appearance can be seen in the neck from the alum salts. Alum salts can create circulatory problems. Your left hip is from your feet not draining fluids correctly. It’s from one or more lymph node(s) blockage, maybe in the inner knee if it’s painful or sore at times. Well shoot! I had been using a crystal deodorant recently, too, thinking it was healthier, but it turns out that they are also loaded with aluminum salts and potentially more dangerous than regular deodorants. If you visit the Knowledge Center at the bottom of the Herbalix homepage, you'll find a surfeit of articles about all the nasty stuff in conventional cosmetics. It would seem the rash your speaking of is from the microvessels bypassing the blocked lymph node in the inside of the knee. Lymph nodes are faucets so we have to start at the feet and work up to the next node. Everyone works down and this is the opposite of our bodies process. The fermented food has help reduce your craving for chocolate and probably detox your leg into the breakout to form the rash. Organic chocolate is best. Most chocolates contain alum in coloring and fill. Sure enough, within one week of starting with the detox deodorant on my armpits and feet, the knee rash was pretty much gone. The ankle rash soon followed. The inside of the calf is still a little rough, but no rash. The hip pain has been harder to budge, but I've had that for nearly 12 years, so I didn't expect it to disappear overnight. I've lost a few more pounds since I started the detox, and my energy levels have been better as well. The odor level has waxed and waned, but never been overly strong, except for one night shortly after I started the detox. Over the 4th of July weekend, we ended up eating at a very nasty greasy spoon restaurant with family (their choice, not ours). You could smell the rancid deep frying oil when you pulled into the parking lot, and everything on the menu was deep fried. I ate, and washed meal with some kombucha that I had back out our hotel room, then put the detox deodorant on for the night. The next morning, I STANK! It was pretty obvious the nasties that had been put in the night before had been sweated out of my body. It's been over two months now, and I am still using the Detox (and Roseline) deodorants. Because of my long term deodorant use and mouth full of metal, I suspect this is going to take a while. Just this week I started what I'm calling my “second stage” of detox, applying the detox deodorant from armpit to breastbone along the collarbone, up the sides of the neck, and along the spine. (Targeting specific lymphatic zones based on Mike's advice.) I've been sweating more again, and have been a little gamier come morning, so I suspect it is indeed pulling more “junk” loose. I've also been using the Smart Salve on my sore hip at night with a hot pack, and that seems to be loosening up the pain. (I ran out of salve for a few weeks and it really started acting up again.) I've ordered ingredients for an herbal tooth powder that Mike suggested to help with the amalgam issues, too. Basically, so far, so good, but one needs patience with this sort of thing. I do think that these products are helping me. Just remember, no doctor can heal you, at best, they can only help your body to heal itself. Every person is different, and what works for me may not work for you. I encourage to do your own research, and do what you can to get to the source of whatever health issues you may have. If you learned something from this article, please pass it along. wow, you describe so many of the symptoms that I suffer from, I have tried conventional, traditional Chinese and Chiropractic, all with limited success. Nothing has completely removed the rash on my ankle. I am headed over to check out Katy and Kitchen Stewardship's post. Lisa, just FYI, the Kitchen Stewardship post was focused primarily on the deodorant aspect, and she felt her homemade deodorant worked better. I do know that she was having odor issues after her recent pregnancy, and I suggested she try to product again to help her clear everything out faster, but I'm not sure if she did. I hope you find a way to clear your rash. I know I was very relieved to find something that worked for me. The itching was driving me up the wall. Perfluorochemicals are known to inhibit thyroid function because they block the iodine receptors in our cells and the thyroid needs iodine in order to produce the two primary thyroid hormones: T4 and T3. They are both pervasive in the environment and in water. Perchhlorate is used to produce rocket fuel, fireworks, flares and explosives and can also be present in bleach and in some fertilizers. The following is copied from a website I will mention at the end (because it is distractingly long): Perfluorochemicals (PFCs) are manmade chemicals that resist heat, water, oil, grease and stains. PFCs are found in common household items such as nonstick pots and pans, stain-resistant carpets and fabrics, stain-resistant paints, flame-resistant clothing, as a part of firefighting foam and are also found in other common item s such as wirecoating and fast-food cartons/containers and wrappers. Pamela – thanks for taking the time to hunt down all this information and share it. I was familiar with the chemicals you mentioned in the first paragraph, but not the ones in the second paragraph. Why is it so hard to get this type of information out of mainstream physicians? I struggle with multiple auto-immune problems. Keeping things in balance is always the most difficult part of the equation…but I do know that when I eliminate all gluten and sugar from my diet (and I mean all) I feel the best…which isn't always great…but definitely better than when the diseases have me by the throat and are choking the life out of me. Good luck in your journey. Chronic illness is a tough row to hoe. Jenny – strength to you on your journey. I actually feel pretty good overall. All the rest of my stats look very good at this time, but I know that it is only a matter of time until the thyroid issues take their toll. I'm trying to address the underlying issues and giving my body what it needs to heal itself. Your post was so interesting and informative. That book really makes sense. My dentist recently replaced all my old fillings. I am definitely more careful with what I eat now. Hi Laurie – wanted to thank you for this post. I read this a few weeks ago and it struck a cord. I became very ill with a virus my son brought home this summer and just couldn't seem to get back on my feet. I went to my PCP complaining of fatigue, hair loss, throat discomfort. She ran tests including thyroid and all came back clear. Several weeks passed and then I read this post, I couldn't shake the feeling that I had to go back to the doctor. This time I went to the ENT and he discovered an enlarged thyroid! I had a scan which found no nodules so now I'm back to get further blood work b/c my PCP did not run the T3 or T4 tests! I too was having pain in my knees and my feet. Thank you for sharing your story. I went to my massage therapist and had him do lymphatic work which I think helped (along with green kombucha) I couldn't help but think that a lymphatic massage might give you a little help with your your hips, of course a big challenge is finding someone that even knows how to do it. I'm enjoying your blog and love the links you provide to support your posts! Great job and thanks again. Thanks for your kind words of support, and good luck on finding a path to healing. I have a mouth full of fillings. And have had Hyperthyroidism 3 times. The first time I let the Thyroid specialist take care of it and put on 3 sizes. The next time I healed myself with a diet change. I used the diet at http://www.hacres.com . After 3 yrs of eating that diet and having everything wrong with me go away including a thyroid goiter, I got tired of it and went back to the (SAD) Standard American diet. After a few years the thyroid condition came back again. I tried a different approach this time and it worked also, it just took a little longer than the Hacres diet did. I still ate meat, but I only ate meat from free range cattle, but I eliminated sugar. I really think sugar is a poison to our bodies. So, yes I still had all those fillings, but the diet was the key for me. Rebecca – thanks for sharing your story. Diet is tremendously important. I was wondering how I would know if my fillings have mercury in them? I had one filling at 8 years old, that would have been in 1985. And another last year. Is mercury still being used, or was it stopped at some point. Can my current dentist tell me if my old filling has mercury in it? ~ Thanks! Sarah – if you have a silver filling, it has mercury in it. The claim is that the mercury stays in the filling and doesn’t migrate out, but that has been proven to not be the case. If you can find a holistic dentist – someone who can safely remove it – that would be an option, but DON’T have it drilled out without protection at a standard dentist. In most cases, the simplest option would be to wait until it requires replacement, and then have it replaced with a safer amalgam.